Polo is a sport like no other. It shows the powerful bond between a player and his horse. Polo is one of the oldest team sports and is often called "Sport of the Kings". His Highness Sheikh Mohammed bin Rashid Al Maktoum has made the "sport of kings" in the United Arab Emirates more fashionable. The meanwhile fourth most important polo event of the world takes place in the spring in Dubai. 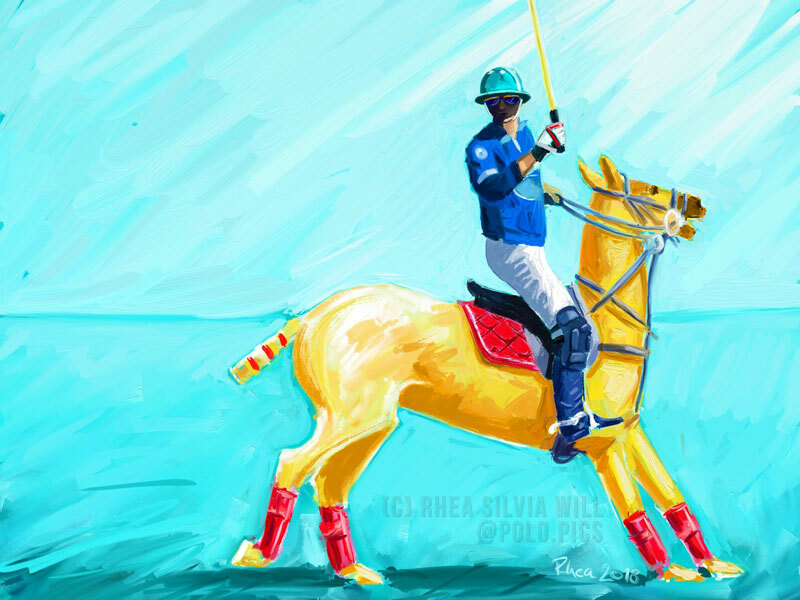 The artist Rhea Silvia Will of Polo Pics manages with radiant colors this exclusive sport whose power, elegance and energy it exudes to express. 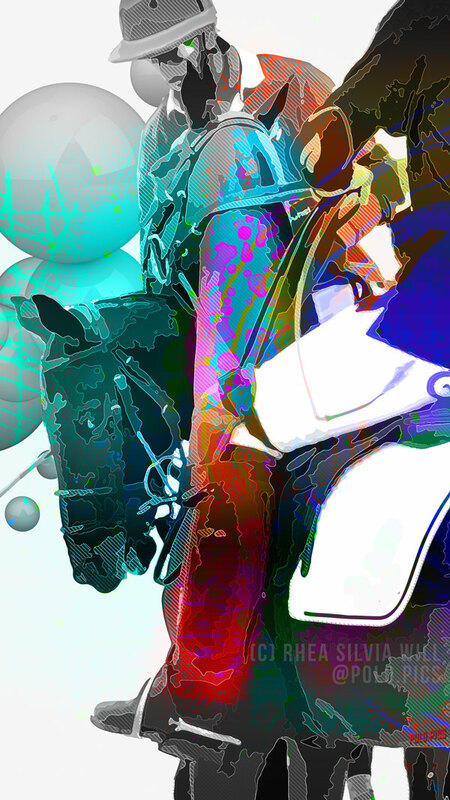 The combination of fast-paced polo game and art works. 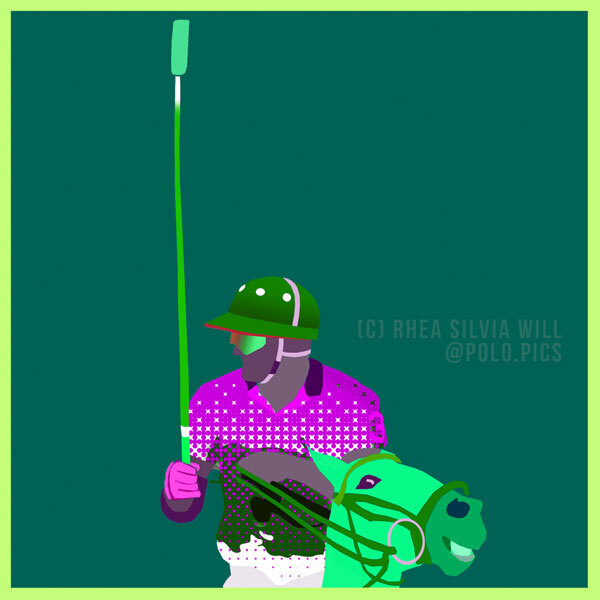 How did the idea for Polo Pics come about? As a full-time interior designer, artist and longtime rider the basics were available from home. 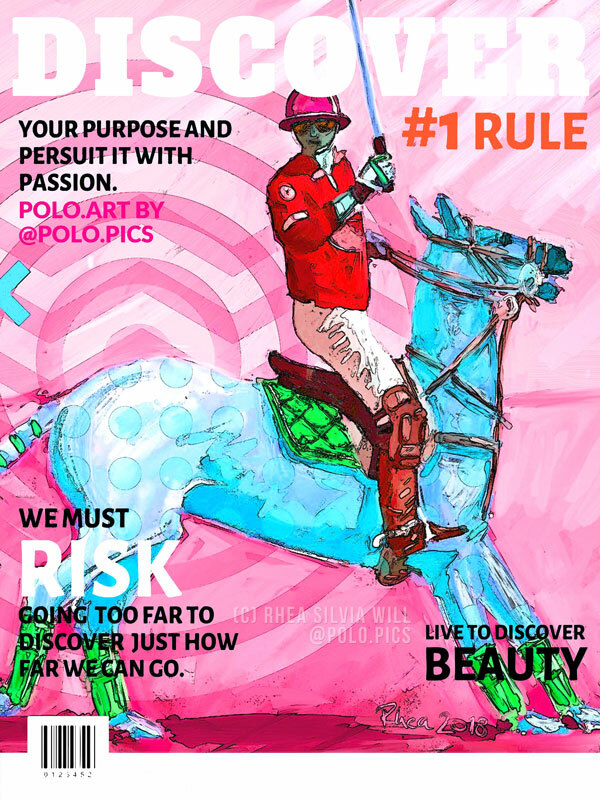 At some point (about 10 years ago) my interest in polo came up, and here I was like most people who meet polo: Once you are infected by the "polo virus", then you cannot let go, because the fascination is so great. As an artist and interior designer, I have always dealt with "spaces", be it two- or three- or four-dimensional spaces, or, more recently, virtual spaces. 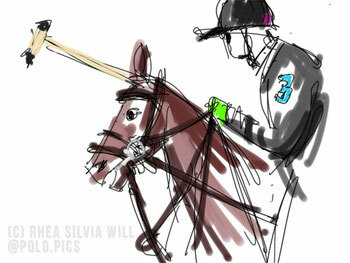 The logical consequence was thus to combine these two passions, art and polo. 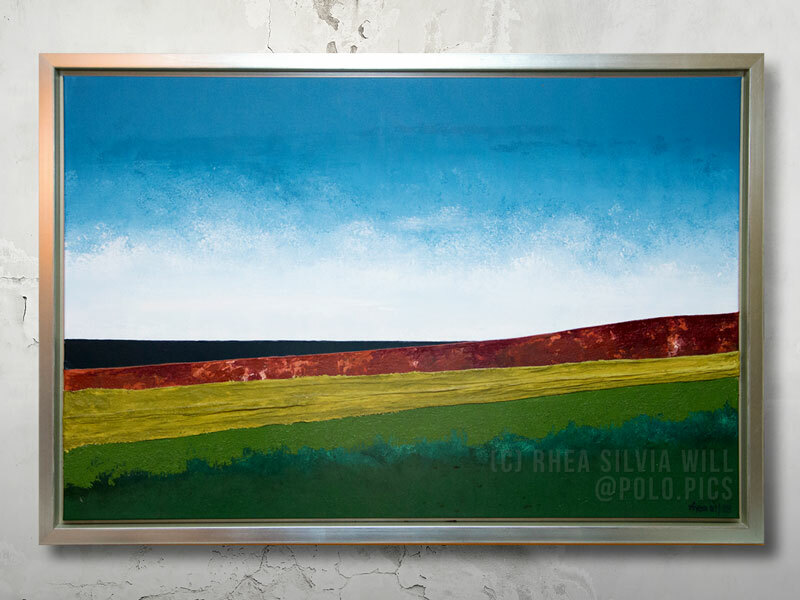 Moreover, polo fits in with my basic themes of expressing myself in art: to fathom and find energy, strength, joie de vivre but also focusing and contemplation and especially their respective sources or origins, inside and outside, to "tap into" them. to retrieve and use for yourself - the sources of positive energy. Polo is for me already the source of pure strength, energy and zest for life - even as a spectator (I'm learning to polo) - and I've now set myself the theme to express this in picture form, with my style and expression now changes almost weekly and I experiment a lot, both figurative and non-figurative. Which materials (canvas, colors) do you use? 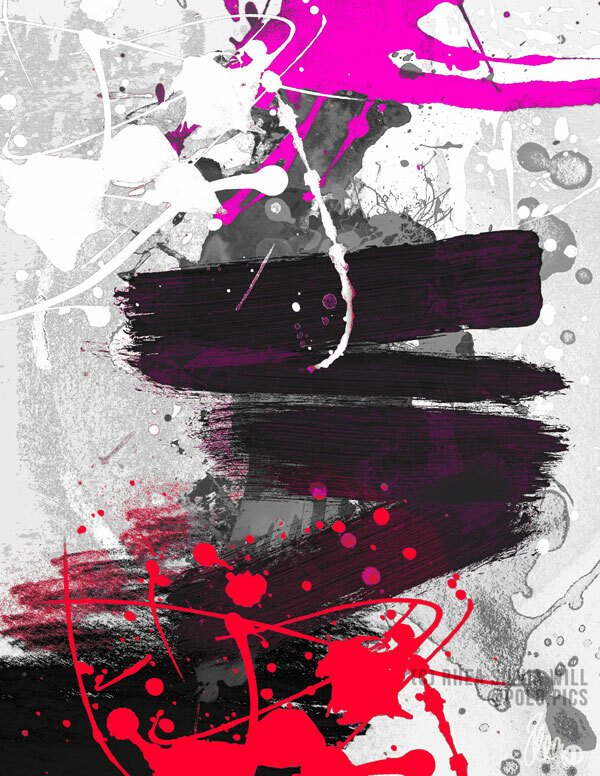 Of the traditional media most like canvas, wood body and paper, with bright acrylic colors, but also colored ink and ink, acrylic marker/acrylic pencils and wax pencils. I often do scribbling, sketching and drawing with sketch pencils on sketch paper, but this can also be done as a final image or as part of a mixed media image, because I am also a very big fan of the "newer" media, like painting and drawing on the PC with pen and graphics tablet or directly with pen on the tablet, both with appropriate software (including Artrage, Photoshop), and I mix this with too Photography, scans of "original" paintings, drawings, etc. So "mixed media" in the broader sense. Sometimes it will also be a multi-scanned and digitally edited image, which I finally over-paint. 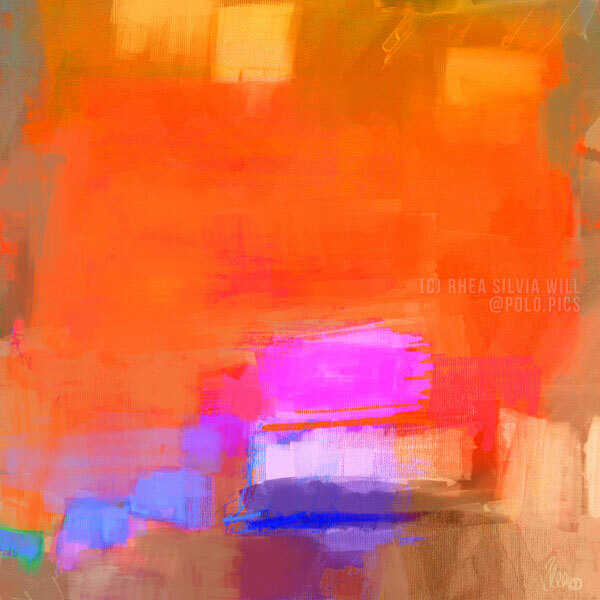 (c) Rhea Silvia Will "Poloplayer Scribble"
Are there any works your heart is so heavy on that they do not sell them? Yes! One of my earlier painted abstract pictures titled "Vitality" and my very first digital image "my saint-blue" (from a series), created from a scan of abstract painting and a photograph. This image is so valuable to me that I would not even need to expose it to the internet. 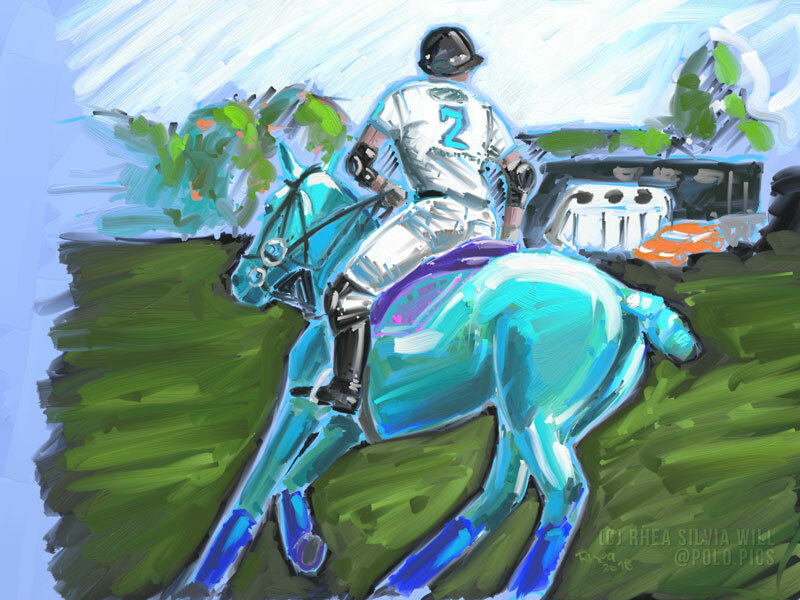 From the polo images it is currently a sketch that has been created very quickly (attached "polo player scribble") and can also be a time-lapse in my Instagram, but I expect to release it as a print for sale. Here I find in a few strokes, what I wanted to express. Especially often it's the "initial pictures" that my heart hangs on. Is Polo actually a common sport in Germany? No, unfortunately, but the sport is starting to spread. Thanks to @german_polo_tour we have great tournaments in Germany, but overall, strangely, the Munich area, unlike other cities and regions in Germany, does not seem to be so popular. What are you in the first place? Interior designer or painter? A clear BOTH ;-), because I, as indicated above, love to create spaces, and that can be both pictorial spaces, thought- and be dream rooms as well as walk-in spaces - 2D and 3D. The boundaries that go beyond the media (two-dimensional image carrier or three-dimensional accessible space, or even virtual space) are fluid for me or are no longer, because an image opens up a space of thought for the creator and viewer and a interior designed space can be a walk-in Be a work of art or a walk-in sculpture (without being raised or raised). I love not only designing rooms but also the appropriate furniture. In both disciplines, art / painting and interior design, I benefit from the characteristics of the other medium, no they apply to both disciplines: dealing with colors, shapes, proportions, perspective, materials, light, shadow, surface, psychology, emotions. A wide and exciting field. What is (good) art in your eyes? The viewer in the positive reactions, thoughts, feelings, conflict triggers, the viewer "pushes" and gives him strength and energy, it inspires, or he / she comes to rest - Power source and contemplation. In terms of color and expression, I am personally fascinated by radiant colors and positive elements, as well as calm and balance-emitting images. Art should and should always be enjoyable and "pleasing". Of course, critical art dealing with all human subjects can also be good art, in terms of accessibility For me it is rather the predominantly positively occupied art that I prefer myself. Is there a work of art in your life that has particularly impressed you? Yes! Gerhard Richter "Faust", Triptych (WV 459, 460, 461 / each 295 x 225 cm): huge, goosebumps, humility, power, all at once - a revelation. What led you to art, to become an artist? My father, of whom I inherited the character talent and who originally wanted to become an architect, certainly plays an important role, but for various reasons was unable to pursue this passion professionally. As a child and adolescents, I have moved a lot and until today faced with many changes of location. This has in any case encouraged me, when I am already in a completely strange environment, to set up my "4-walls" suitable for me to have a retreat. And from an early age onwards painting, drawing and crafting were always my companions, also often together with my father, also partly under the guidance of different artists with different media. The inner drive is the "creation of spaces", in support of energy and contemplation, as already mentioned above flat-2D or spatially-3D. What I cannot say I have to paint or express in the picture, for myself and for others. "To form an image, to have an intuition, to make us human beings - art is meaning, meaning, like seeking and religion." What kind of art or what kind of artwork would you like to realize? 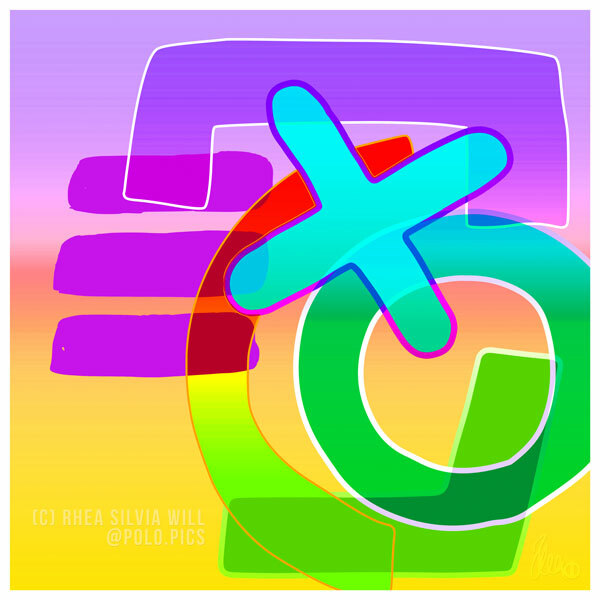 Quite up-to-date still the search, the finding and the employment to bring together polo and abstract art in the picture, polo to "abstract", possibly in a few lines. What exactly I mean I report it when I found out or painted. It's my turn. And I really want to realize diverse art using 3D printing, which is then in the context of polo topics such as jewelry, vessels and sculptures. In addition, the topics "augmented reality" and "virtual reality" are on my agenda ... here, too, the complete application: Polo, interior design, space and image. I'm planning a lot. What does a day in the life of Rhea Silvia Will look like? Externally, I like to enjoy my place of residence and its surroundings: I need the nature, the green and the mountain view as inspiration, am out as often as possible, I also like to go swimming, also on the Bavarian lakes, sometimes horseback riding (Polo unfortunately not yet regular) and enjoy also from time to time the Bavarian snack with beer, in summer, of course, in the beer garden. The whole in alternation with customer-related projects in the interior design, and the picture invention, because I design pictures, they are representational or abstract, also completely on customer's request (as in the interior design with appropriate advice). Have you ever been to Dubai? I have to confess, unfortunately no, I have not been to Dubai yet, although about 25 years ago I planned the design concept of a large, representative kitchen for a local Emirati and his wife and family (contact is still in effect today). Unfortunately, at the time I was unable to realize a stay in Dubai for private reasons, but Dubai is certainly at the top of my travel destinations list! I suspect that the combination of glittering, ultramodern metropolis, sea and desert will inspire me a lot. Polo is a very popular sport in the Emirates. Will there be an exhibition in Dubai in the future? What question have we not asked, but you would like to answer? "What is your biggest dream?" The answer would be to bring all my interests together, i.e. an interior design project, be it private or commercial (living, shopfitting, trade fair construction, hotel planning etc.) where I can completely realize everything: develop rooms, plan furniture, realize the art, paint, design (curate also using other art that is not mine) .... and that does not mean that in the end it would be "just a walk-Rhea Silvia Will project", but in close cooperation with the user and would arise for him. Yes, that's it. And I know that dreams can come true. 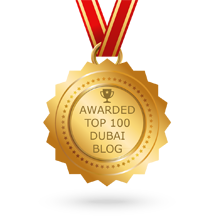 In this sense, best wishes to you and all readers and interested people to Dubai and elsewhere, and many thanks for the selected questions!